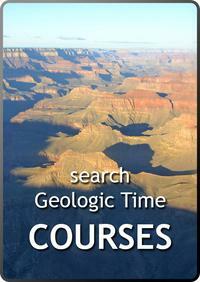 Several resources about teaching geologic time are available from the SERC websites. Below is a list of project websites that provide visualizations, teaching activities, and tools that may be of use in the classroom or in lab. 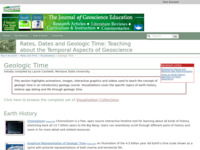 Click the images above to browse teaching activities and course descriptions related to geologic time. Collections are contributed by faculty and may include service learning projects, writing assignments, field trips, course descriptions and syllabi. 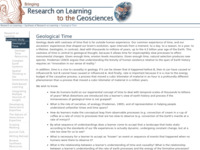 Teaching About Rates and Time - This site hosts a wealth of resources about teaching about (geologic) rates and time, including pages on using analogies to teach about time, assessing temporal learning, examples of learning goals, and teaching about geochronology. 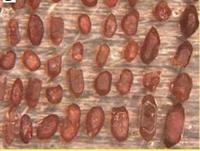 Early Earth Resources for Teaching - This site hosts a collection of links to SERC materials that involve teaching about the early Earth. It also contains links to information about how to address creationism in the classroom. 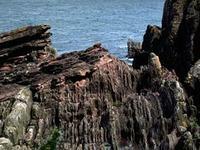 Research on Learning - Geological Time - This site provides general information and an extensive bibliography of references about research on learning about a subject most students have difficulty comprehending due to its vastness - geologic time. Geologic Time Visualizations - This set of ~10 visualizations includes animations, images, interactive graphics and videos used to teach the concept of geologic time in an introductory geology course. 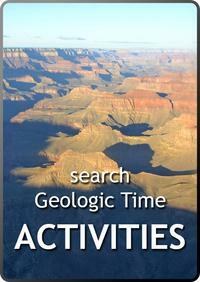 Visualizations cover the specific topics of Earth history, relative age dating and life through geologic time.